Agribusiness & Food Industry Management B.S. The Agribusiness and Food Industry Management program focuses on business applications that support the agricultural industry. The major offers a wide selection of coursework designed for students to assume leadership positions in the management, marketing, and production of all agricultural products from “field to plate”. The core curriculum is designed to provide students with an understanding of business functions in application, theory, and practice. Two career emphases of Food Industry Management or Animal/Equine Industry allow students to work closely with their advisor and design a curriculum for their specific career goals. Internships place the student in their chosen field for up to one year to experience daily activities they will be involved with. Students also have the opportunity to participate in intercollegiate marketing competitions, promoting agricultural products. Enterprising students are employed by the department in the operations of the W.K. Kellogg horse unit, livestock and farming operations of the Kellogg Ranch, and the Farm Store at Kellogg Ranch, which markets Cal Poly’s finest fruits and vegetables. Private sector careers abound in all areas of agribusiness and food industry management. Many graduates work for commodity boards and trade organizations that represent products from almonds to zucchini. Many alums work in sales, management and brokerage of commodities such as hay, grain, and feedstuffs, often internationally. The large produce industry in Southern California demands graduates that are ready to work and knowledgeable in all sectors of production, procurement, sales, and accounting. Other careers include pharmaceutical sales, animal hospital management, animal rescue management, livestock, dairy, and equine industry management, farm and ranch management, packinghouse management, and retail operations of supermarkets and specialty stores. Alumni have pursued legal careers involving agriculture as well as agricultural communications and journalism. Public sector careers are currently in high demand due to an aging workforce. It is estimated that over 60% of the nations federal, state, and county agricultural workforce will retire during the next decade. A multitude of opportunities are found within the 7 mission areas and 27 agencies of the USDA. These include the Animal Plant Health Inspection Service, Foreign Agriculture Service, National Resource Conservation Service, Forestry Service, Food Safety, Risk Management, Economic Research Service. Interesting career areas within these agencies include smuggling and interdiction, poisonous plant reconnaissance, habitat restoration, and crop, livestock, and commodity modeling. Agencies within Homeland Security and the Department of the Interior also offer rewarding careers protecting agricultural systems from terrorists, monitoring public lands with the Bureau of Land Management, conserving resources with the National Park Service, and water related careers with the Bureau of Reclamation. More locally, trained farm advisors consult and work with local farmers and ranchers to improve practices and profitability. They are also involved with nutrition programs and 4-H. County Agricultural Commissioners have large staffs, which monitor pesticide applications, weights and measures, local farmers markets, and commodity stabilization and standardization. The Agricultural Science major is an outstanding major to prepare for any general agricultural career. Coursework in the major covers all areas of agriculture, preparing students for careers in Agricultural Journalism & Communications, Farm and Ranch Management, and business careers in many support areas of agriculture such as consulting and sales. Students with an interest in becoming agriculture teachers are advised to enroll in the agricultural science major and obtain a B.S. degree, or they may complete a B.S. degree in one of the other approved majors in the College of Agriculture. Agricultural Science majors and all students who wish teacher certification are required to show competency in four areas of agriculture. This can be accomplished by completing the subject matter program in agriculture or receiving a passing score on the CSET for Agriculture. Specialist Credential. The Agricultural Specialist Credential requires a minimum of 45 additional units beyond the B.S. degree. Some of the graduate work may be applied towards a Master of Science in Agriculture, Agricultural Science sub-plan. The primary function of the Agricultural Education Program is the preparation of teachers of agricultural education for the public secondary schools of California. Specialized pre-professional and professional courses are offered for undergraduate and graduate (fifth year) students. Technological, scientific, and broad general education course work for agriculture teaching candidates is offered throughout the College of Agriculture and other Colleges including the College of Education and Integrative Studies. Enrollment in a Single Subject Credential program is required in order to qualify for student teaching. Candidates for the Single Subject teaching credential who are not agricultural science majors are advised to wisely use the electives available in their major in order to complete required teaching credential courses which are not normally specified in their undergraduate major. Because of the wide range of variables involved, all candidates for teaching certification are urged to consult the Agricultural Education Program Coordinator as early as possible in their college careers. 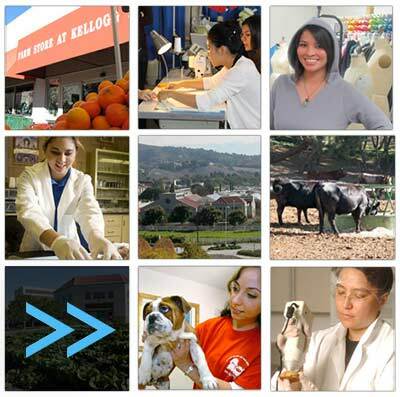 Interested in attending Cal Poly Pomona? Click the button below to request more information.